Let me set the scene, it was the evening of December 25 and Santa (my hubby) brought all the knitting goodies I asked for – I guess I was good in 2009. 😉 I was higher than a cat on catnip! After I cuddled my sock yarn, sock knitting book, and new interchangeable set (kind of pokey, not a good idea), I immediately balled up the most gorgeous skein of gifted yarn, flipped through the book and set to work swatching. Before I knew it I had cast on and I was off. Except, I wasn’t off to the races, I was knocked off kilter. How could a seemingly easy sock require me to labor over the instructions just for the cuff? I peered down the loooooong pattern, and realized I was in over my head. 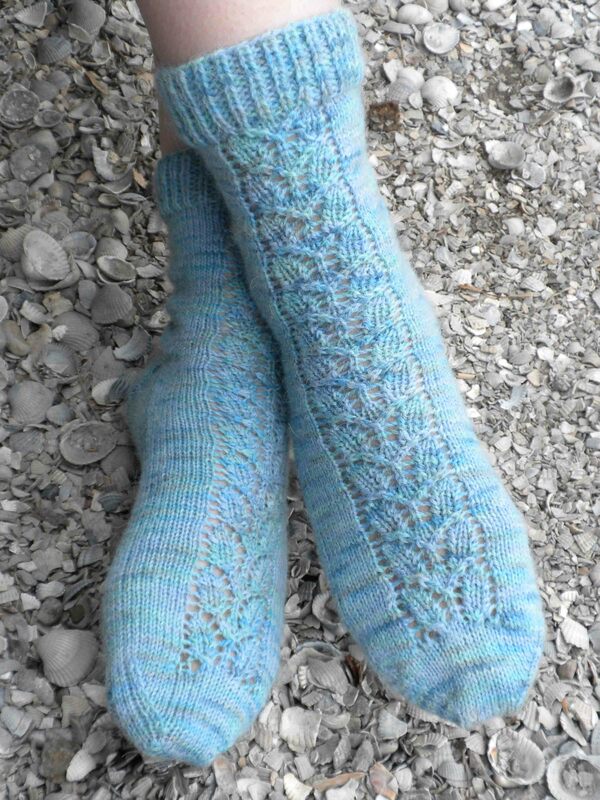 I’d previously knit several pair of straightforward socks and was ready to advance, but not this far. So, what to do? And thus, the Airy Lace Panel Sock was born. I nervously submitted it to the Knit Picks Independent Designer program and was overjoyed when it was accepted. And I’ve been, oh-so-slowly, designing ever since!